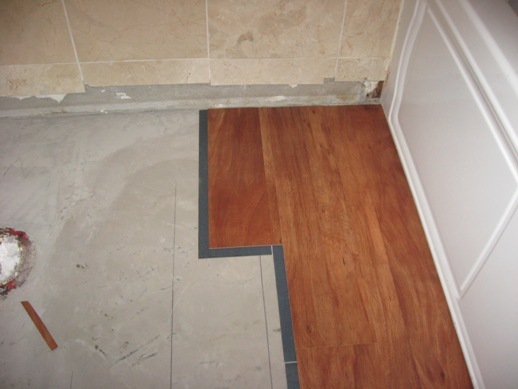 **Super Springy 2019 Cyber Sale** **We offer Free technical support" for any Item we sell, backed with 36 years experience in the Flooring & Shower industry. 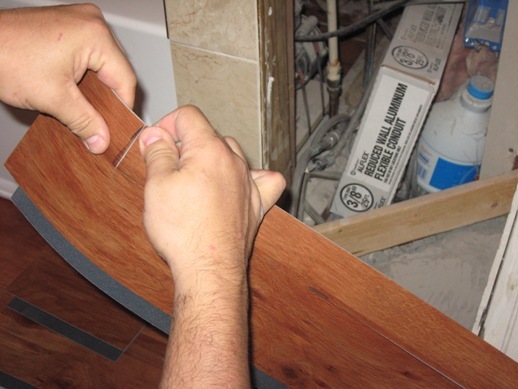 ...Name one other Flooring site in the world that offers *Text Install support*... We are the Real Deal! * Call or Text:502-379-1009 | 812-399-9800 With any questions. 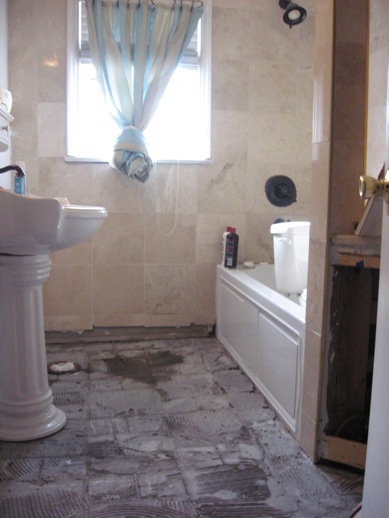 We can fit your shower without you having to move your drain! We are an American owned and operated small family run business. ...and I do not have to spend 10k a month on webdesigners. For Tech Support Text is best. 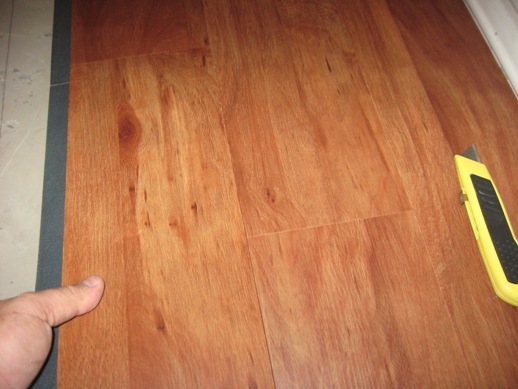 As you all know we are one of the nations largest suppliers of Konecto Flooring. I have it in my own home! 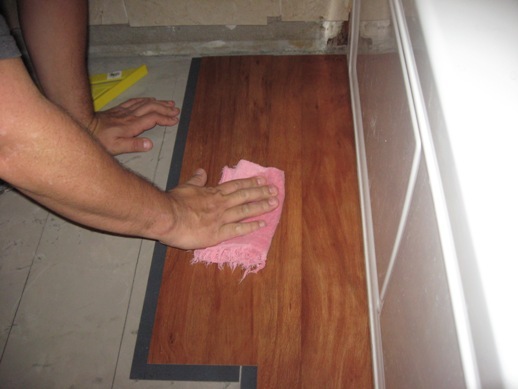 We give Konecto Floors Top Billing on the site as it has proved itself to be a cost effective solution to a wood like floor. Our four kids and the our Chihuahua have proved its wearablity. Konecto is pet proof and kid proof. 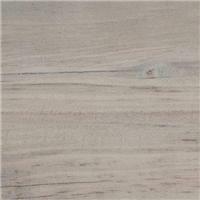 Metroflor Luxury Vinyl Tile-Konecto Flooring is hottest selling floor on the market. It glues only to itself so no messy glue is needed. 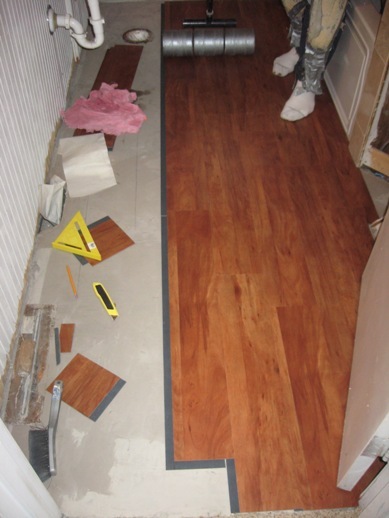 The Konecto floor can be laid over almost any subfloor with minumal floor prep. 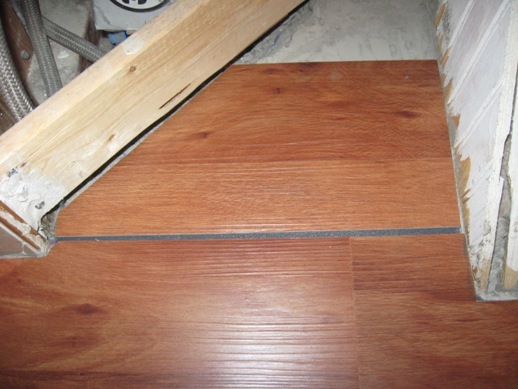 Konecto Flooring is warm and comfortable under your feet and adds look of wood or premium tile without the trouble of wood or the mess of tile glue. 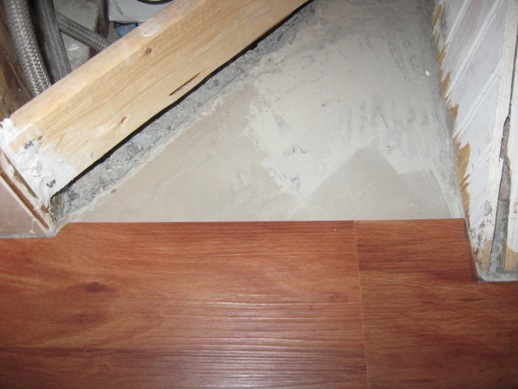 It is the easiest floor on the market to install your self. 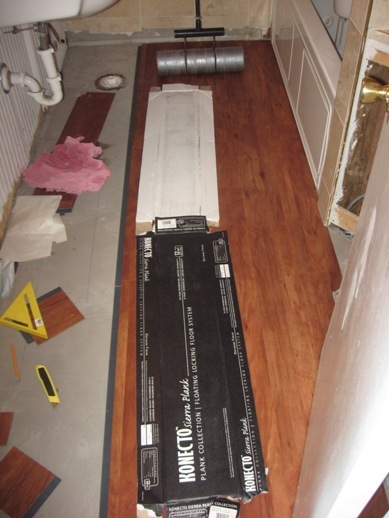 We have all seen articles about the install of this flooring, when I read them it seems there are relevant facts missing. 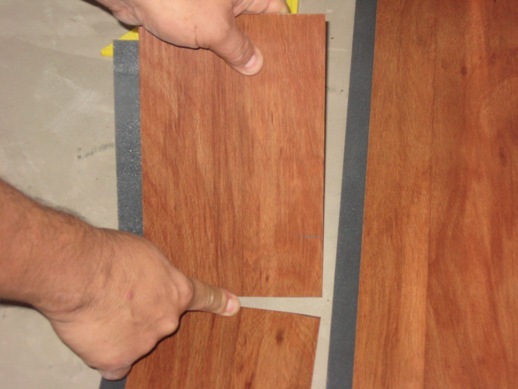 I base my knowledge off 30 years as a second generation flooring installer that has worked with Konecto since it came to market. I installed the Sierra Westwood Konecto in my bathroom this weekend. 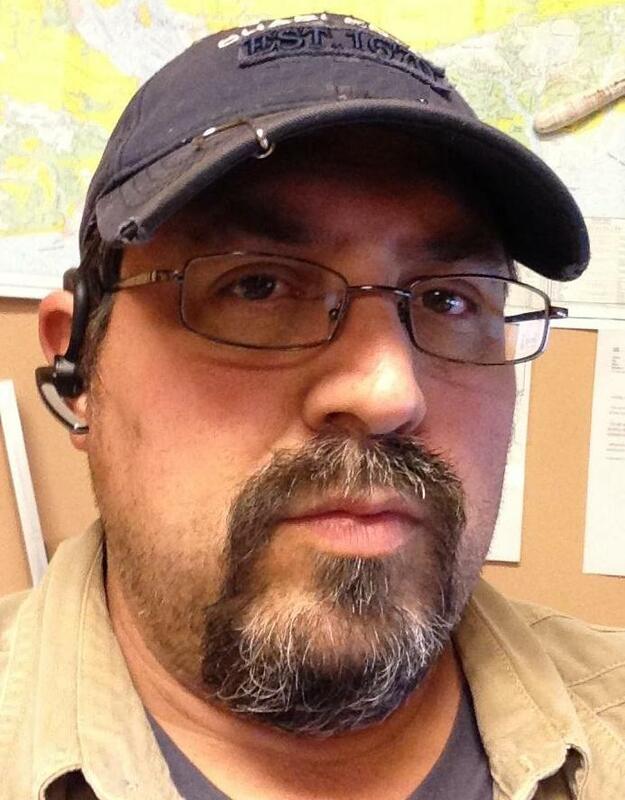 I will walk you through the install. Once you get the Konecto be sure to properly acclimate it. This means;The Konecto must be in the room you are going install it in for at least 48 hours prior. the room tempature must be between 65-85 degrees. 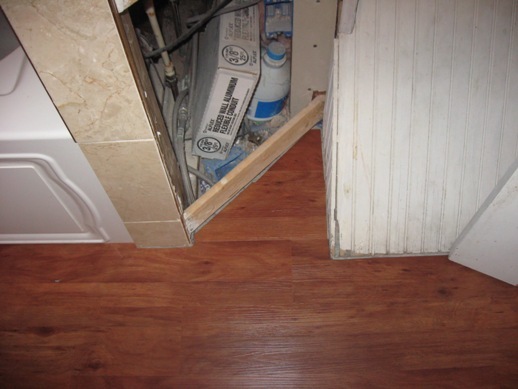 If you are replacing carpet, remove the carpet and padding and let the concrete come to room temperature as well. Prior to installing be sure to have your 3 lb handroller and your 100lb roller.You can rent these at all most any tool rental shop. The handroller can be purchased online if it is not available in your area. 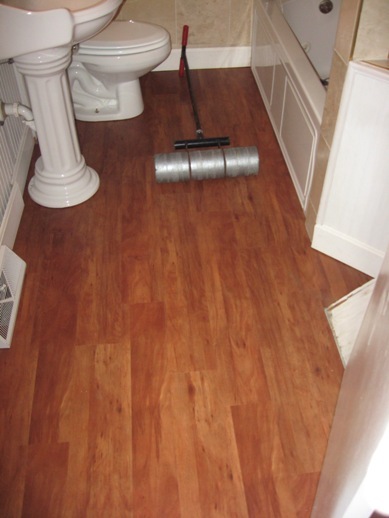 Be sure your floor is very clean and free of moisture and you have dust free environment. After three coats of patch to fill the ridges from the ceramic tile. You can normally just back fill the groutjoints and lay over but I have heated floor system I did not want to defuse any heat. 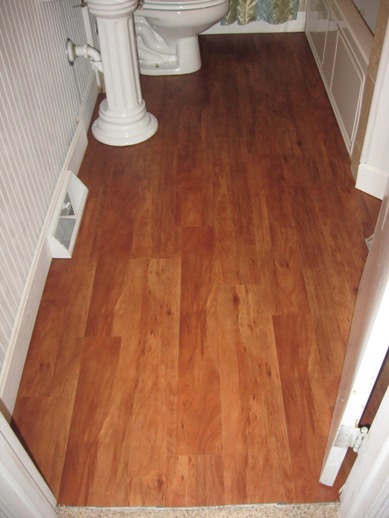 You will want to pull from several boxes at once to keep shade variations consistent to keep the look of real wood flooring. 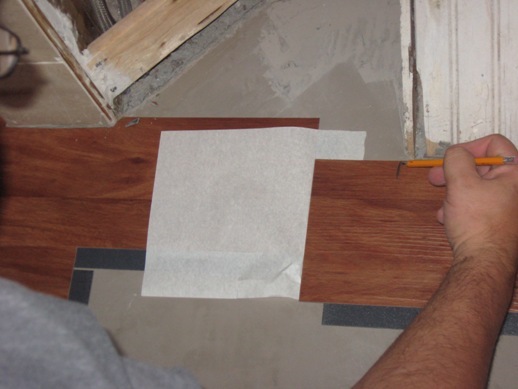 Set your first plank in place 1/4" from your longest wall, the glue strip facing you, remove the next planks from the boxes you have set in staging. The second plank you will cut aprox 8" shorter than the first plank. With your yardstick or speed square measure the point and market it with your sharpie or pencil then score it with your untilty knife, once it is scored, snap it back it will come right off. If you use a sharpie besure your mark is cut off as it will be permanent. 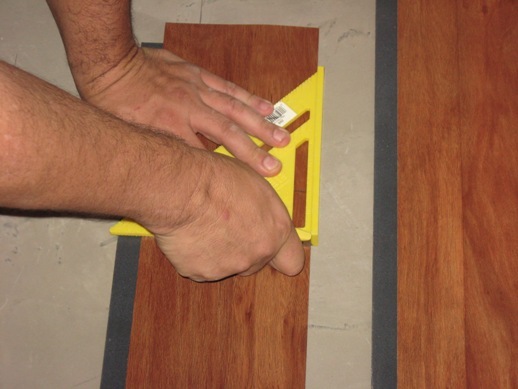 Align the end of your second 1/4" from the wall and lay into the glue glue strip facing you. Now you can get rolling, take your 3 lb handroller and roll the seam. As luck would have it, we sold our last handroller.... I used a damprag to resist friction and pushed each seam in by hand. Your third plank you will set on the end of the first plank, align it properly but do not roll the seam yet.get ready for your forth plank, it will set on the end of your second plank, as you set it in place start at the overlapped corner, set your end first and then align your length as you do this since you did not roll the end of the prior plank there will be movment allowed to align your planks lengths. You see I have a cut already. Once you are happy with the alignment continue these two rows to your wall end. 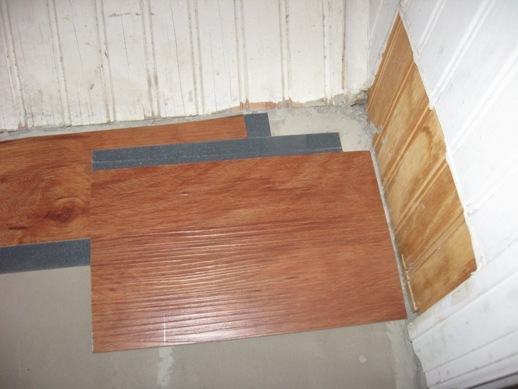 You are now ready for your end wall cut; Take the plank you intend to cut and reverse it... set the wall side 1/4" from the wall to maintain your expansion mark the plank length in accordance with the stopping point of your last full plank, draw your line, make the cut. 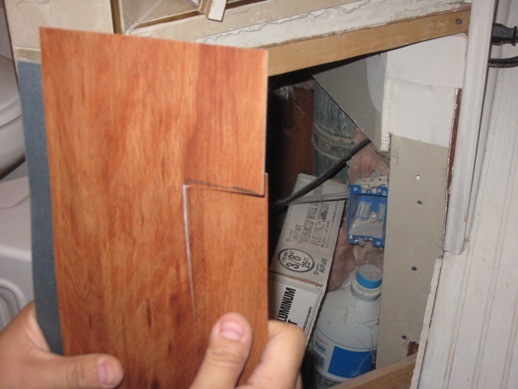 Turn the plank back around and it should be the perfect fit with your 1/4" expansion already set in place. Repeat this to finish your first two rows.Be sure to roll each seam with your handroller. 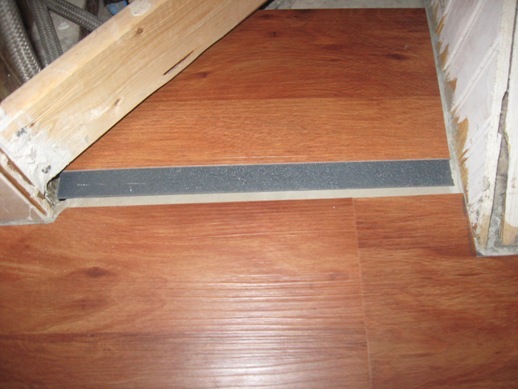 Confirm the floor has 1/4" expansion on all walls. Now you are really rolling (pardon the pun). 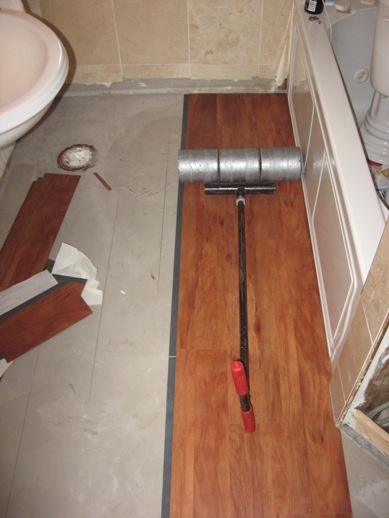 Get your 100 lb roller in action and roll the rows be sure, to not contaminate the visible glued strip. 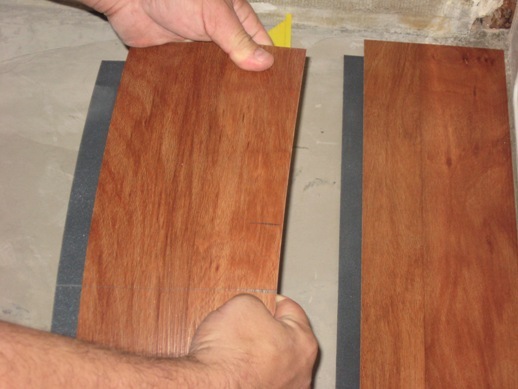 Continue this process throughout the room, set your stagger on the end joints about 6-8" from the prior end joint, this will give you floor a true woodlike appearance.Roll each seam with the handroller and keep the 100 lb roller moving on each several completed row sections. When you are done, roll the floor again a few times just to be sure. You see; The glue on the strip is a pressure senstive epoxy, this mean the more pressure applied the stronger the bond grows, so... you want the most amount of pressure applied will installing. You are done! Way to go, looks great! 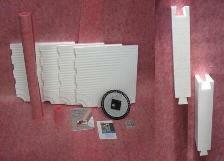 * If you go into a two day install, cover the glue strip overnight with the paper from the boxes. * Be certain you acclimate the product... and the room ! * If you only have kneepads with a hard suface tape the front of them up so you do not scuff the floor, I use several layers of duct tape when I do this. * Make sure to have several new blades for your knife, one will not be enough. 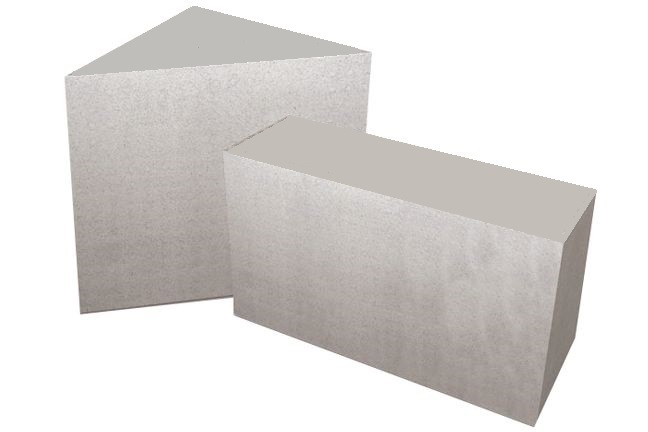 * Use only Konecto products you will find the "best price" on the internet. 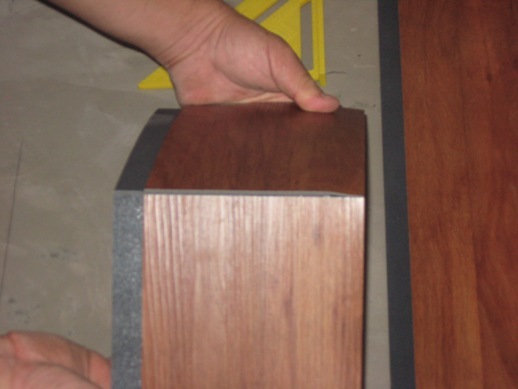 There are other vinyl planks on the market but Konecto is a leader in the industry and has worked out all the bugs. 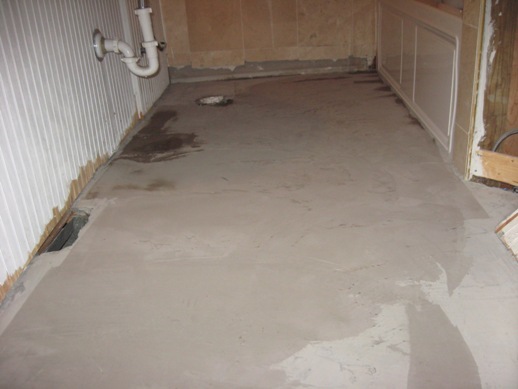 * If moisture is present in your floor, dry it completely and then do a moisture test prior to install. * Do not contaminate your glue strip. * I use a damp rag to reduce friction while working with the floor. * Never use a steam cleaner on a Konecto Floor, it will cause the edges to cup and void your warranty. 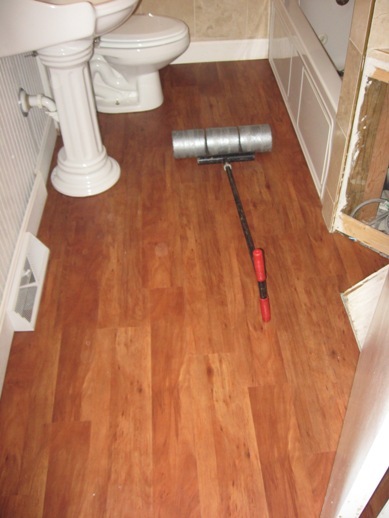 If this has happened to you, contact the steam mop company and request they replace your floor. They should not be advising this method with any floor and should held responsible for their claims. * You have a full warranty with an online purchase, if a local retailer says you only have one year,they are intentionally misleading you. * Turn in all your warranty paperwork. We accept all major credit cards by email and phone. Indiana Floors does not rent, trade, loan, or sell your personal information, or any other information which may identify you, to third parties. For more detailed information on our privacy, security, ordering and chargeback policy, please continue reading. Our secure server uses advanced encryption and firewall technology to keep your personal information private. cannot be read as it travels to our ordering system. We have extremely strong security measures in place to protect against the loss, misuse, or alteration of your information while it is in our control. Deliveries: All UPS or FED EX deliveries are sent out with no signature required and will be left on your porch or by your door if you are not available. Once this package is delivered we bear no responsibility whatsoever unless the package has been damaged in route to you, if it has been damaged no replacement will be considered until there is an approved claim by UPS. When you purchase from us you will entering an agreement to comply with all our standards listed,this agreement is a binding legal contract. Returns if approved: may be subject to restocking and or handling charges, shipping costs for return items are solely at customer’s expense. Special Orders: placed are subject to a 35% restocking fee if order is canceled or returned. All returns should be insured and must be packaged as to avoid damage in shipping, and shipped via UPS; items damaged in shipping will not be credited. No cut orders are returnable. No Konecto orders are deemed returnable unless a valid claim has been issued by Metroflor. 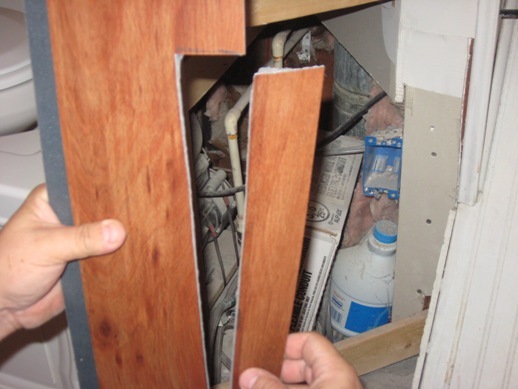 All warranties implied are manufacture warranties. 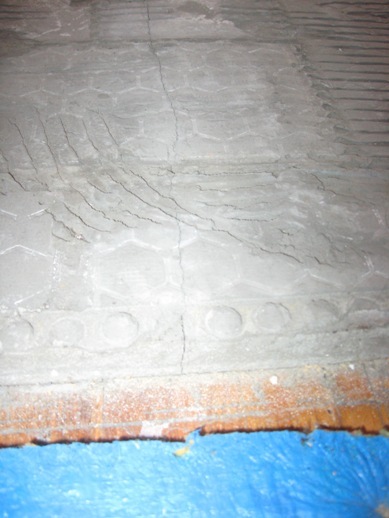 We are not the manufacture and cannot be held responsible for warranty claims. Please contact us if you have any questions. 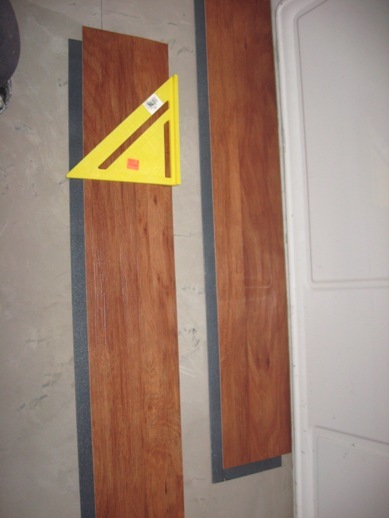 Your purchase agreement with Indiana Floors LLC.com is a binding contract and you waive all rights to contact any of our suppliers unless permission is giving by Indiana Floors LLC.com. We will act in arbitration to the best interest of the client to achieve your full refund or replacement.Any activity outside this could result in the loss of warranty in full. Any invalid Credit Card Chargeback attempts for valid orders will face a charge of up to $37.00 per transaction. Our CC Processesors charge a min fee to start a chargeback. We suggest you do not attempt a charge back request with your credit card company without first letting us resolve your issue. If your chargeback attempt is invalid and the chargeback is reversed in our favor or we have to rebill the order, there will be a fee of up to $37.00 per transaction. If the invalid chargeback is not repaid within 48 hours, Indiana Floors LLC reserves the right to rebill the card on file for the full amount of the order plus the invalid chargeback fee as it applies.